Available in 12" x 50' roll or 24" x 25' roll. Made from black aluminum, non-reflective, high heat resistant material. Each roll is packaged in a convenient, durable corrugated box. 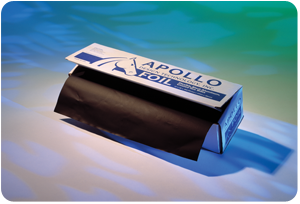 Apollo foil is a versatile easy to use and apply product. When applied it conforms easily to hardware or fixtures.